I recently celebrated my 49th birthday. It’s hard to image one more year and I hit the half a century mark! Time is flying by and I plan on the next fifty years being better than the first fifty. Earlier in the week Chris asked if I wanted to go out for dinner for my birthday meal. I told her honestly that I love her cooking and preferred to stay home and eat in. Besides, I have great wine in my cellar so I could pair something really nice. After talking further, I decided I wanted “Surf and Turf” with a nice salad and a baked potato. Now that the meal was figured out, I had a few days to decide what I wanted to drink! We decided to invite Dave and Heather over to share my day too. I wanted to grab a special bottle but what was it going to be? Some of my higher end favorites are Verite La Joie, Joseph Phelps Insignia or Backus, Shafer Hillside Select or Continuum. 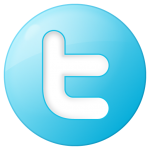 As I pondered I decided to try something different. I do not know much about Bordeaux wines but I have had a few over the years. I do know my favorite so far is Chateau Lassegue. The first time I was introduced to this wine was at a Verite event. Chateau Lassegue is a joint venture created by the late Jess Jackson and Pierre Seillan. As men rooted to the land, Jess Jackson and Pierre Seillan were intrigued, drawn to, and then won over by the efforts of the right-bank vintners. As men belonging to the world of wine who reached maturity they now know it is the best place to cultivate complexity, delicacy, elegance and these intimately silky tannins. While Bordeaux goes through a difficult period in its long history, it is extremely reassuring to see that these terroirs still fascinate and fill wine professionals and investors with enthusiasm. For over 35 years, Pierre Seillan has created wines in the “new” and “old” world. Today, Pierre Seillan and Lassègue partners Jess Jackson and Barbara Banke are realizing their common dream to make fine wines in Saint-Émilion. The Saturday that was my birthday arrived. For the most part it was a normal day. I received a number of birthday wishes on my facebook page and appreciated the well wishes from friends I have not talked to in a long time. We had to run to the local wine making shop. We are now making our home-brew wine (Port and a Cabernet Sauvignon from Napa Valley) so stay tuned. 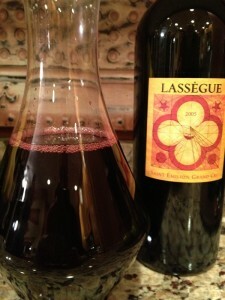 About and hour before dinner was ready I pulled the cork from the 2005 Chateau Lassegue and poured it into a decanter. I wanted it to breath a while and get happy, I was filled with anticipation! Chris had the steaks and shrimp on the grill and it was a matter of minutes before we ate. I decided to grab my tasting sheet so Dave and I could rate the Chateau Lassegue. 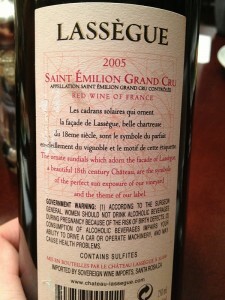 The Chateau Lassegue was very aromatic and fruity. We could smell Cherry, Plum and bright red fruit. Slightly dry. 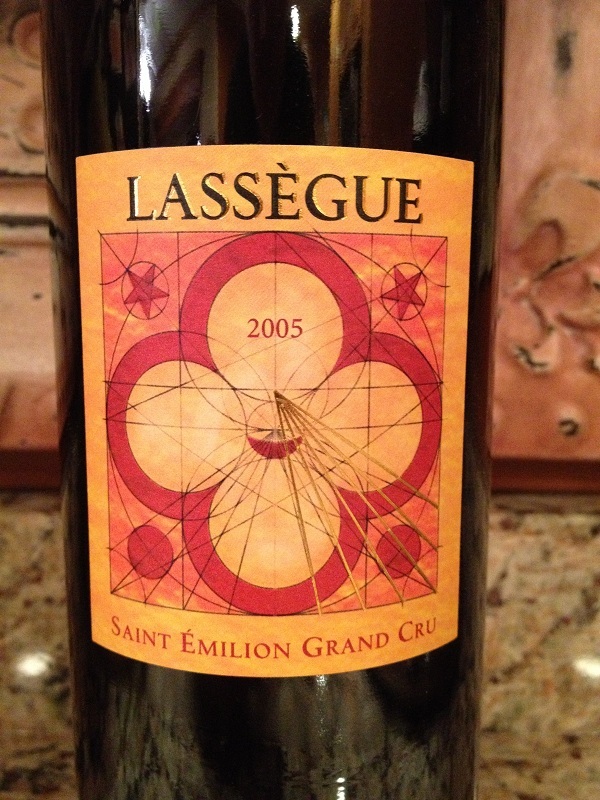 The Chateau Lassegue was full-bodied and the acidity was right on. My mouth watered with every taste. The tannins were medium with a long finish felt in our mid palate. This wine was very flavorful! We could taste Cherry, Cocoa and a Dark Chocolate finish. 60% Merlot, 35% Cabernet Franc and 5% Cabernet Sauvignon. 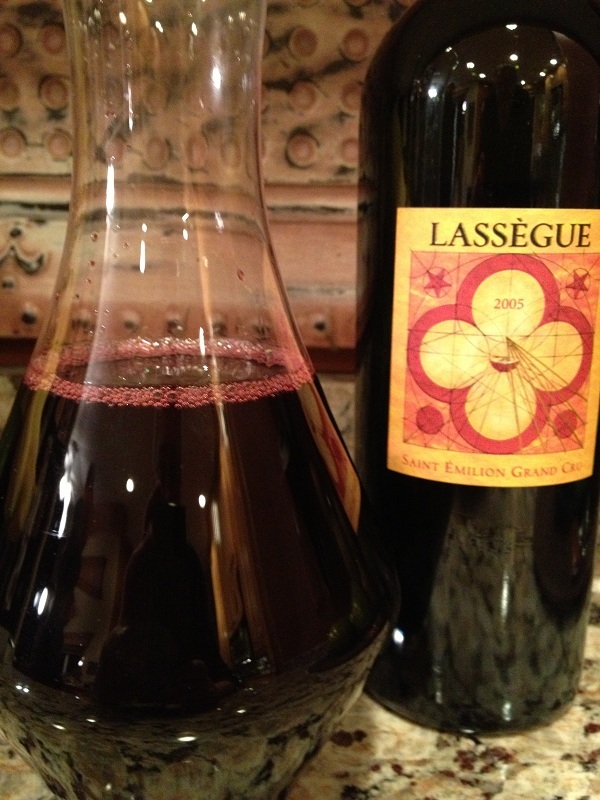 We rated the 2005 Chateau Lassegue four glasses! I have five more bottles and can’t wait to have another bottle in the future.